It was almost like being an NFL free agent. George Rushing had earned that right after earning his degree and being a team player at Wisconsin. But he longed to catch passes, score touchdowns and be a part of a modern-day, pass happy college football offense. He loved playing in Madison. He loved being a Badger. But Wisconsin is a run-first offense, and that wasn’t going to change. So the graduate student from Miami went searching for a new home. He found it on his first trip, a stop at the University at Buffalo. 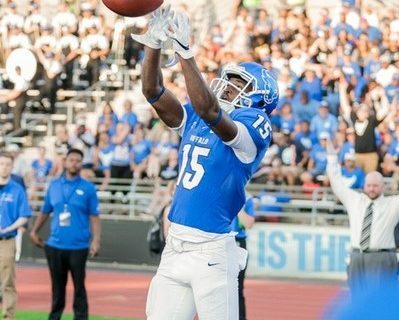 UB was recommended to George by his Wisconsin coaches, who had relationships with Bulls head coach Lance Leipold and receivers coach Rob Ianello. George liked everything about UB, so much so that he cancelled his other visits and signed right away. “Through the recruiting process we made the decision we were going to explore a graduate transfer at the receiver spot. We wanted someone who could fit in the room and add to the depth at the receiver position,” said Leipold. So after 39 games at Wisconsin, George made his Buffalo debut Saturday with two catches and two touchdowns. The scores were the first of his career. “It felt great. It was fun. The school I was previously at doesn’t throw the ball too much, so it was a fun experience,” said Rushing. Even though Anthony Johnson and K.J. Osborn are entrenched as the Bulls #1 & #2 receivers, Rushing knew there would be plenty of passes to go around. He also knew Tyree Jackson was a dynamic quarterback. George was asked if he’s seen a quarterback like his current QB, Tyree Jackson. Remember, Rushing played at Wisconsin in the Big 10 and faced some of the nation’s top teams. The NCAA allows players who have graduated to transfer to a new school and play right away. That’s how Rushing was able to step right in at Buffalo. He has already emerged as a leader to the receiver corp, especially a group of young Bulls who will be the next wave of wideouts. But right now, no matter what the role, George is enjoying the ride. Trading in Wisconsin red for Buffalo blue is proving to be the right call.